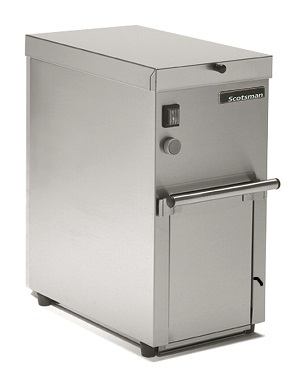 The Crushman 360 ice crusher from Scotsman can turn the hardest ice types to crushed granules in seconds. It’s the perfect machine for bars and restaurants who require crushed ice for displays or cocktails but in small quantities which doesn’t justify another unique ice machine. • Rugged, it can convert all kinds of cube ice (including hard bagged ice) into different-size granules by means of a simple mechanical adjustment. • Compact design, only 245mm wide x 430mm deep. • Built entirely in stainless steel 18/10. • Safety First – It is fitted with micro-switches both on the lid and on the door. • Easy to clean with a removable drip tray. Scotsman modular ice machines, whether that’s a MXG supercuber, a NW dice ice machine, a MFN nugget machine, a MF superflaker or a MAR scale ice freezer, they require a suitable ice storage bin to compliment the production capabilities of the head unit. Scotsman manufacture a range of ice bins in the NB/SB and UBH series. These ice storage solutions come in a variety of different dimensions and capacities allowing you to customise an ice production solution that’s perfect for your specific business needs. • New sleek, contemporary styling. A perfect match for all Scotsman modular ice machines. • Convenient, built-in scoop holder. • Fully removable door gasket seals door opening to reduce ice from melting, easily disassembled for manual cleaning. • High density polyethylene insulation, interior is sanitary, easy to clean, and resists scratches and scuffs from ice scoop. • Stainless steel bin exterior for durability; door in rotocast plastic with two end hinges is stable, reliable operation. 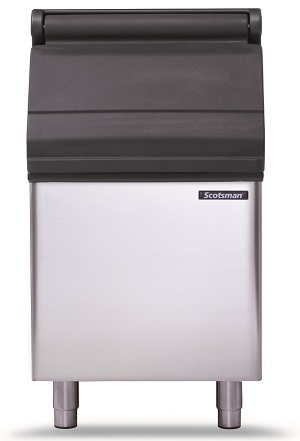 Scotsman Modular Ice Makers can also be paired with Follet Ice Storage Bins. 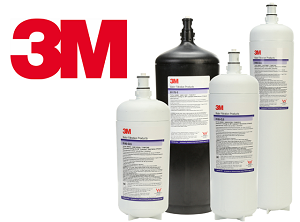 Hubbard Systems is proud to partner with 3M who provide a world class range of water filtration systems which will ensure that your Scotsman Ice Machine produces hygienic, crystal clear ice reliably and consistently. • Higher flow rates, no need for manifold systems or for separate pre-filter and housing. • Reduces the ability of calcium and magnesium to precipitate on the evaporator plates as hard scale. • Allows fast and easy change-outs with a 1/4 turn while minimising the possibility of leakage and contamination. • Allows direct or easily adaptable connections to existing plumbing lines. • Reduces microbial content in water and protects customers from cyst and 99.9% of common pathogens. • Combined sediment reduction with chlorine, taste and odour reduction for high dirt loading applications. • No separate shut off valve required, easy to change by un-skilled staff. • Easy to monitor filter blockage for identification of time to change filter. • Independent qualification of performance and guarantee of product safety.